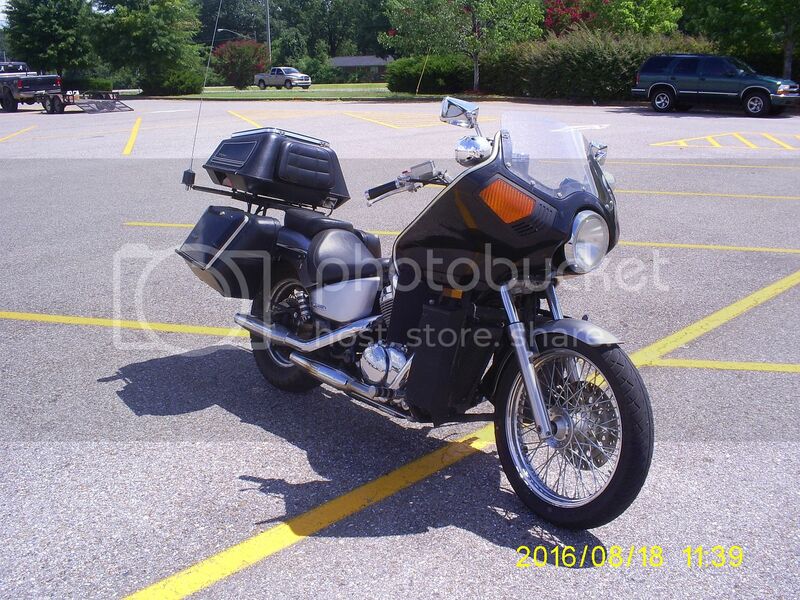 Well, I sold my 79 Vetterized GL1000 to a local fellow. He came by today and showed me what it had become. I am happy for the fellow and he did a great job, but its just not a Vetter. Did you ask him about getting back the removed pieces? Yeah, he sold them on eBay. Welcome to the forum Breeze! 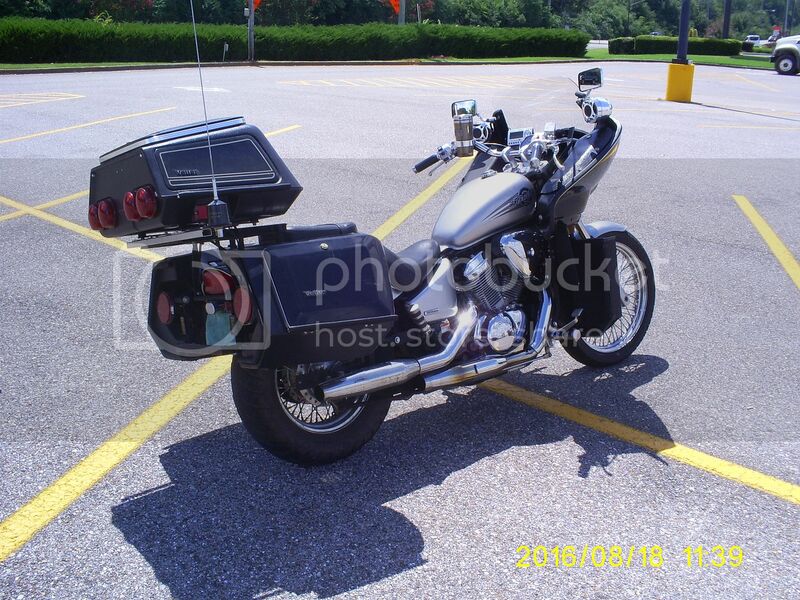 I went the other way by mounting a Windjammer IV, bags, and trunk on my modern 2006 Honda VLX600. Most people strip and Bob VLX600's. Once a guy parked beside me on his VLX600 Bobber and didn’t realize we were riding the same Bike because it looks so different. He asked me what kind of bike it was as he had never seen a bike with Vetter Touring gear mounted on it. He was stunned when he realized it was the same make and model as his. Then there are the people that ask me how my little 600cc bike can haul that big fairing, bags, and trunk around. They are shocked when I tell them Crag Vetter actually designed that fairing, bags, and trunk around a Kawasaki 500cc triple so in reality it fits my bike perfectly. The old CX500's were another bike that were routinely Vetterized. My VLX600 performance actually improved along with the gas mileage after I mounted it on my bike. The only problem I've run into by mounting a Windjammer on my bike is that the odometer suddenly rolled over 30,000 miles a couple of weeks ago because I ride it a lot more now. Most people assume that only GL1000's came with Windjammers. In reality the Windjammer was a little on the small size for those GL1000's.Vetter designed and sold Windjammers years before Honda introduced the GL1000. Scott, thats the way it should be done! There are two more VLX600's running around here with Windjammers on them after they saw mine. Both left notes on my Bike asking me to contact them so they could ask me how I did it. I invited them to my shop and let them see my mounting system and how to do it. They were amazed how much better their Bikes are with a Windjammer mounted on them. They are home made Lowers. Due to the (factory) feet forward controls Vetter lowers would never work no matter how they were cut to fit. What I did was fabricate a crash bar made of 1 inch square 11 gauge steel that's integrated with the fairing mount. It's a rectangle except for the outside lower corners so it clears the pavement in turns. Then I plucked an illegal Coroplast advertisement sign from the side of the road to make my lowers. I cut the sign to fit the bar, painted it black with paint that will stick to plastic, trimmed the edges with black duct tape, and then attached them with black tie straps. They work great! They deflect air toward the radiator and protect the bike and myself road debris. Being so cheap to make they are disposable. If someone hits me from the side that crash bar is strong enough to prevent my leg from being crushed. Most factory made crash bars are made from thin wall tubing that will bend easily which will not help you in a crash at all. They do not lay flat on the crash bar. My first set I made did, which caused a lot of turbulence I cut two more 4 inches longer and bent them 4 inches from the outside edge. The outside 4 inch side has a slight angle that deflects air away from my legs. The inside sides are angled to deflect air at the radiator. Here's a picture of the front of my bike so perhaps you can see them a little better. There are two more deflectors behind the Coroplast crash bar mounted lowers. These are made of aluminium and attached to fairing bracket mounts and foot control mounts. They deflect air and rain water that gets by the Coroplast lowers. As long as I'm moving I pretty much remain dry when it's raining unless it's raining cats and dogs. The image is disabled for me here, but if I right-click it and select open in new tab, it comes up. Looks good. Damn what a waste of a beautiful bike. Bobber is what you do to an abused bike missing parts. Oh, I don't mind a GL1000 being naked. After all, it's what Honda originally planned for the bike, a naked sportster. It was probably the Vetter being fitted by Craig and others that popularised it more than Honda ever dreamed of. Big faired tourers had arrived with that bike and the Vetter. Previous big faired tourers were ugly, unwieldy, troublesome beasts, from what I recall of them, and hardly any were capable of continent crossing without some serious maintenance. The GL1000 really suited its new clothes anyway, so I can accept it either way. Unfortunately, the days of being able to pick up a cheap early Goldie are long past, at least over here. I don't mind as well. But my personal preference is not naked. The fellow that did the GL Bobber did a good job. Not my thing, I prefer stock bikes with period correct aftermarket parts. AKA Vetterized.